The Spring 2011 issue of Maryland Home and Garden, a publication of the University of Maryland Extension, is chock-full of great information for creating eco-friendly landscapes, including a detailed article about getting your soil tested. The importance of soil to plant growth can be summed up in the aphorism "it’s better to plant a $2 tree in a $25 hole, than a $25 tree in a $2 hole." Soils contain the nutrients, water, and living organisms that help create healthy and sustainable gardens and landscapes. The first step to improving your soil is to invest a small amount of time and money to have your soil tested. • Many home gardeners over use fertilizers. This results in excessive nutrient runoff and water pollution. Over-fertilization especially with fertilizers high in nitrogen, can lead to overly-succulent, weak growth and encourage sucking insect pests like scales, aphids and adelgids. Most landscape plants get adequate nutrition from a healthy soil rich with organic matter. • Poor, compacted soils can be improved through the generous addition of organic matter. This spring, spade or till in a 6-8 inch layer of leaf compost or well-rotted manure. If you want to grow vegetables, flowers or herbs this year and your soil is especially poor, consider building a raised bed and filling it with a purchased mixture of topsoil and leaf compost. • April marks the beginning of the mowing season. The height and how frequently you mow your lawn is very important. 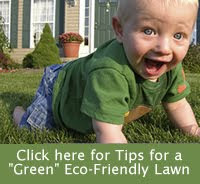 Cool season grasses such as tall fescue, creeping fescue, and bluegrass should be maintained at 3.0 inches. Try not to remove more than one third of the leaf surface at any one time, repeated mowing that removes this much of the blade will ruin the lawn. Mulches should be applied only 2-3 inches deep around ornamental plants and kept away from direct contact with shrub and tree trunks. Mature trees do not benefit much from being mulched except to provide a protective barrier around their trunks from riding lawn mower damage.